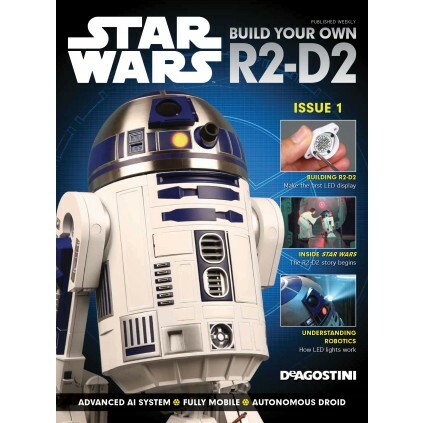 Your R2-D2 is also an ADVANCED, AUTONOMOUS DROID, with interactive intelligence, and multiple modes and functions. 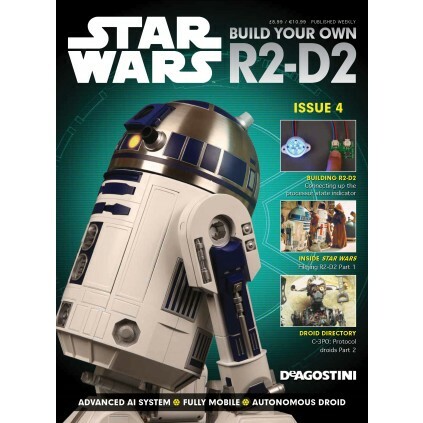 You will build your own R2-D2 from components engineered to look just like the original Star Wars props – plus state-of-the-art modern electronic components. 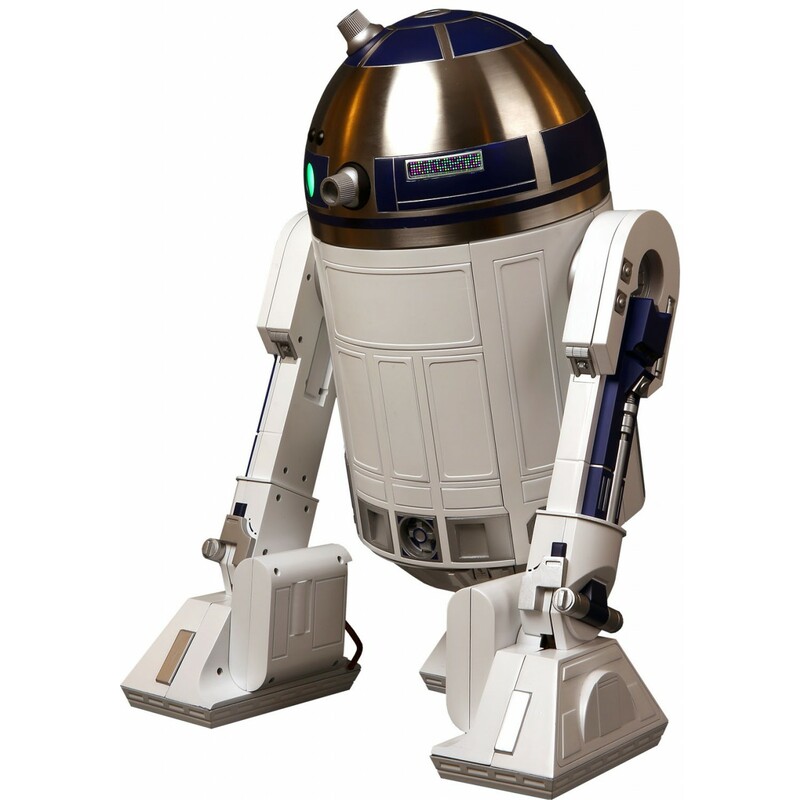 Taking inspiration from the remote-controlled film prop, your fully functioning half-scale model R2-D2 is engineered in the same way, and has been authentically detailed based on the droid seen on screen. Once assembled, you can choose whether to retain the factory-fresh finish, or give your astromech a weathered, ‘used’ appearance as in the movies. 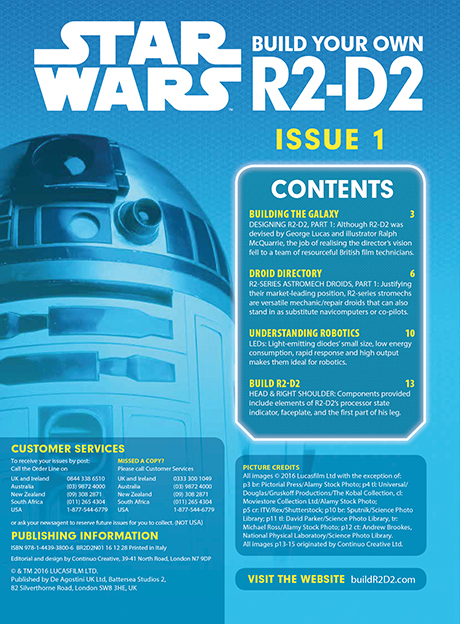 When your R2-D2 is complete, you will be able to download the special control app to your smartphone or tablet. 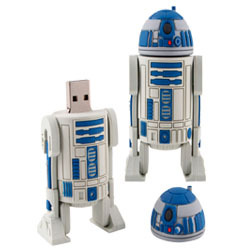 Then fit the rechargeable batteries, switch on and connect R2-D2 to your wi-fi network. 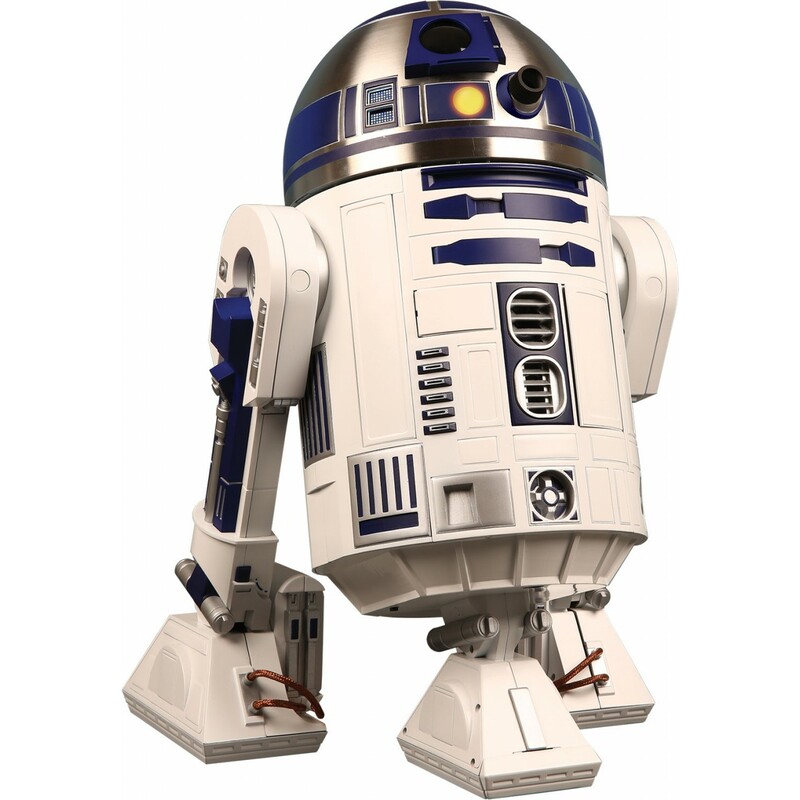 With his sensors, camera, microphones, sophisticated logic boards and powerful motors, R2-D2 can interact with his owner, move and behave just like the astromech from the Star Wars movies. 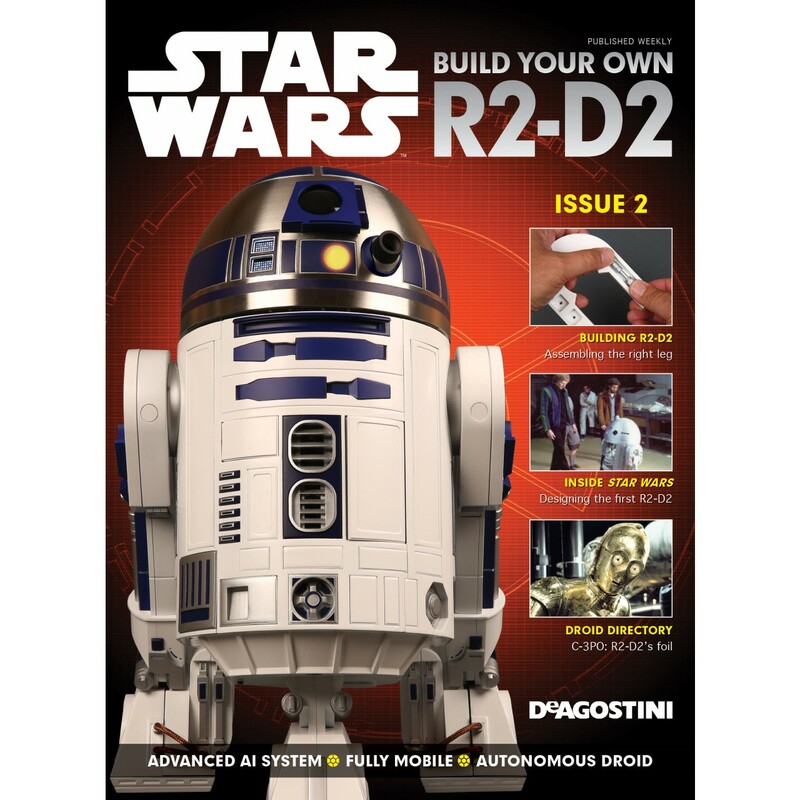 Each shipment includes 4 official full color magazines with your easy-to-follow - detailed Assembly Guide plus a fascinating look at the amazing story behind the little astromech and the other droids, machines and vehicles of Star Wars as you follow in the footsteps of the master movie makers. 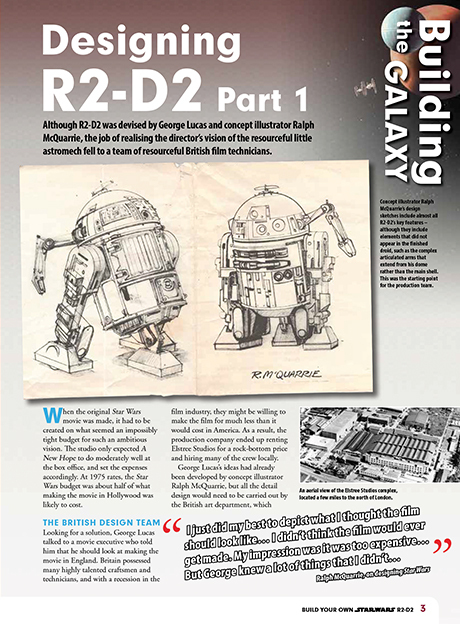 This fascinating section lets you look behind the scenes to see the techniques used to construct and film the droids, ships, sets and creatures of all the Star Wars movies. Explore their development from the earliest concept to the final stunning prop models, photographed in minute detail. 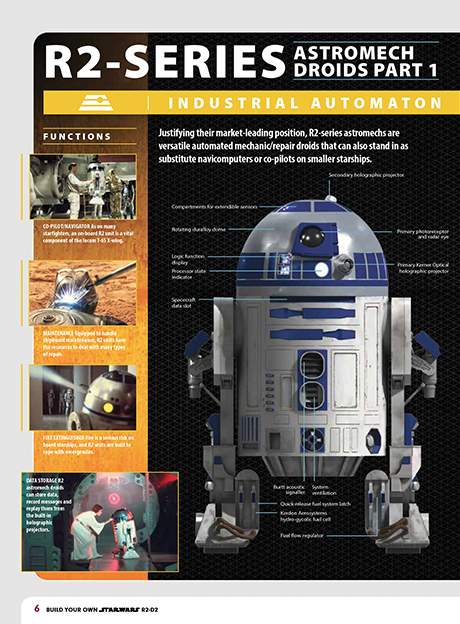 Explore how R2-D2 fits into a Star Wars universe packed with droids built for every conceivable purpose, from providing medical care to waging war. Beyond their appearance in the movies, discover their functional features through blueprints, specification sheets and a comprehensive technical analysis. 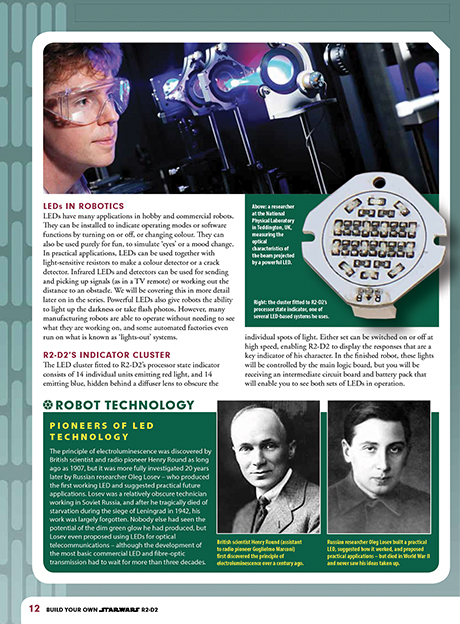 This section explains the technology behind the parts that you are assembling. 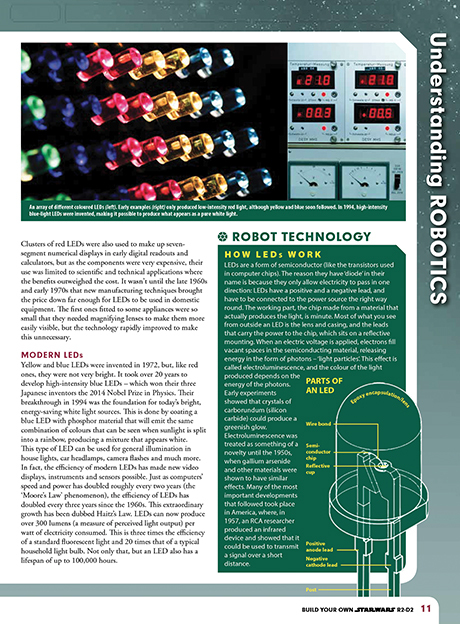 These illustrated articles help you to understand the function of electronic and mechanical parts, including things like sensors, motors, wi-fi, logic boards, and much more. 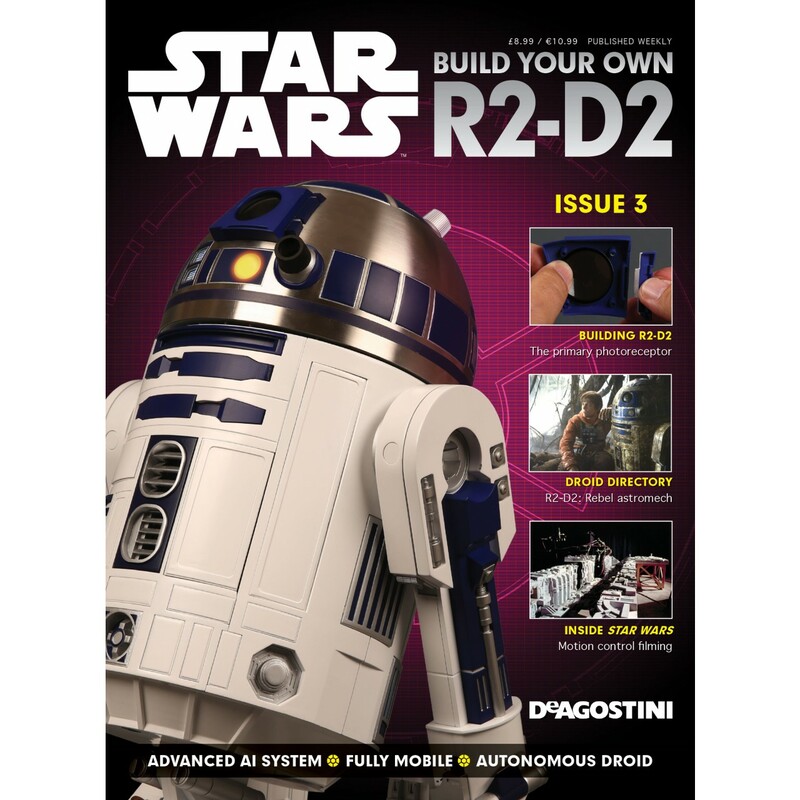 These step-by-step assembly instructions make it easy to put together the parts supplied with each issue and test that your droid is working correctly at each stage. There are lots of hints and tips to make it easy for novices and expert builders alike to get perfect results. Standard offer 12 or 25 months subscription: $129.99 / month plus $9.99 S&H per shipment or $64.99 / month plus $6.99 S&H per shipment. Premium offer 12 or 25 months subscription: $139.99 / month plus $12.99 S&H per shipment or $69.99 / month plus $6.99 S&H per shipment. 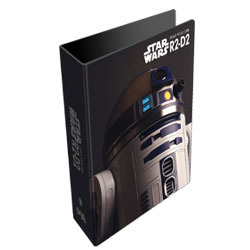 Free gifts with the standard option: Build your own R2-D2 binder with your 2nd shipment and Exclusive R2-D2 USB Stick with your 4th shipment. 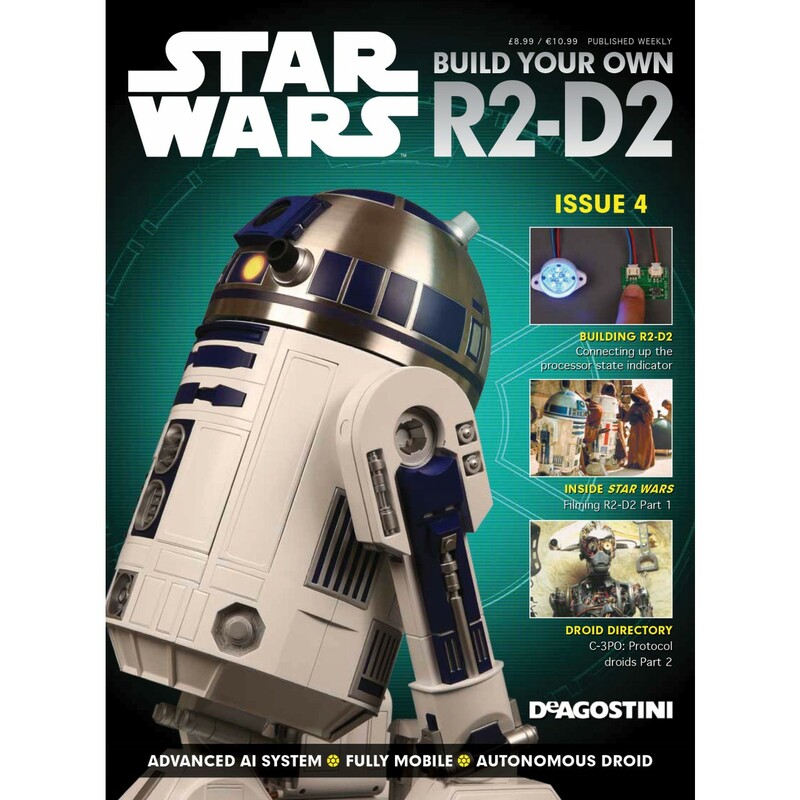 Each shipment includes 4 official full color magazines with your easy-to-follow detailed Assembly Guide plus a fascinating look at the amazing story behind the little astromech and the other droids, machines and vehicles of Star Wars as you follow in the footsteps of the master movie makers. © & ™ 2017 LUCASFILM LTD. LLC. All rights reserved. Used under authorization. Upgrade to a Premium Subscription & receive these high quality collectibles. 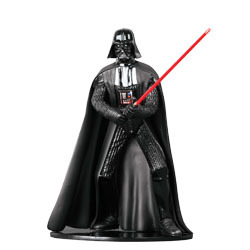 Darth Vader (with the 10th shipment), amazingly detailed limited edition large-scale 120mm-tall model of the most iconic villain from the Star Wars saga – Darth Vader. 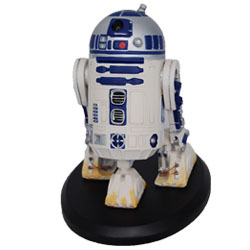 Made from solid cold-cast resin porcelain, carefully finished and painted by hand, the figurine is based on an original sculpt approved by Lucasfilm. The result is an incredibly life-like and detailed depiction of the feared Dark Lord of the Sith at the height of his powers. C-3PO (with the 22nd shipment) stands just over 6 ½ inches and nearly 4 inches tall respectively. These finely crafted 1/10th scale, cold-cast porcelain statues come hand-painted and handcrafted. R2-D2 (with the 25th shipment) stands just over 6 ½ inches and nearly 4 inches tall respectively. These finely crafted 1/10th scale, cold-cast porcelain statues come hand-painted and handcrafted. One-piece metal dome: R2-D2’s real metal dome spins just like the original, enabling him to turn to face his owner, look around his environment and point his camera and projector in any direction without moving his body. 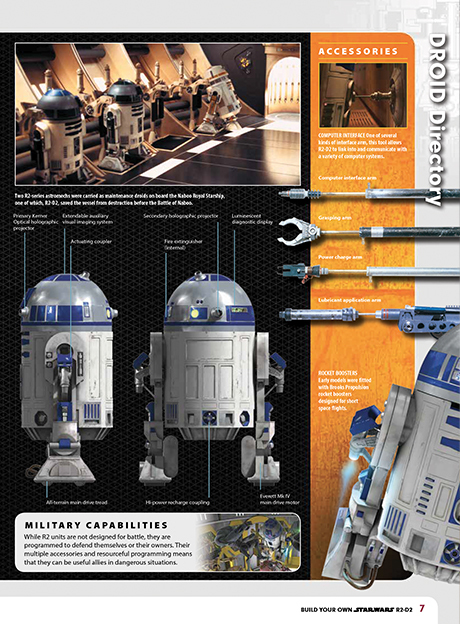 Dual mode: You can switch R2-D2 to operate under command or in autonomous ‘AI’ mode, when he will behave like the willful astromech in the movies. 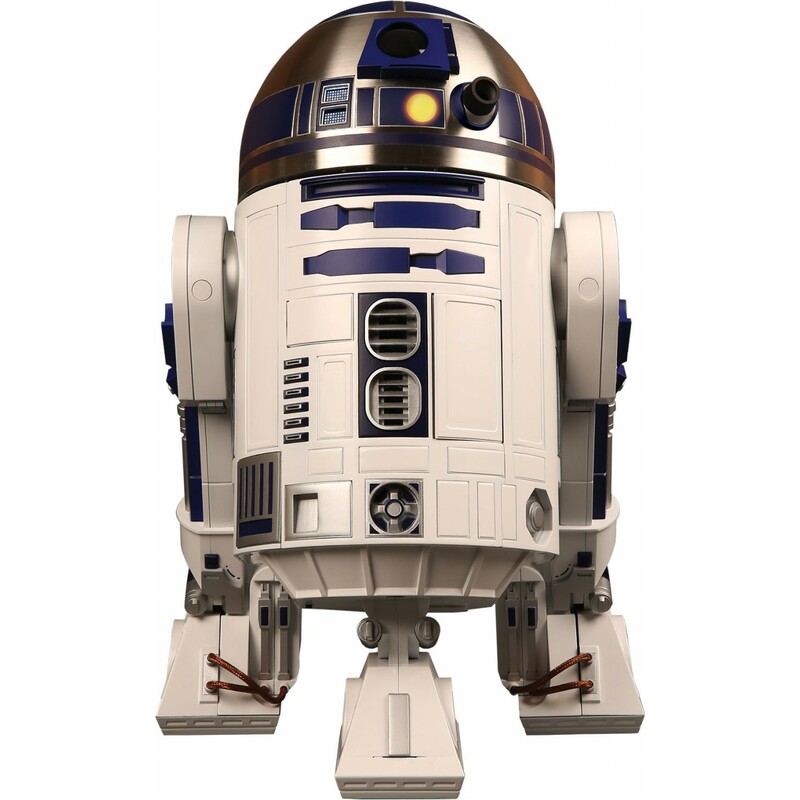 Video/Still Camera: The video/still camera in R2-D2’s head allows him to take snapshots and short video clips, which can be stored on your mobile device. You can turn his head to focus on any person or object in his field of vision, and his programming includes the ability to detect human faces. Wi-fi enabled: Wi-fi receiver and transmitter, communicating with a tablet or smartphone. Communication: via authentic chirps, whistles and colored light displays. 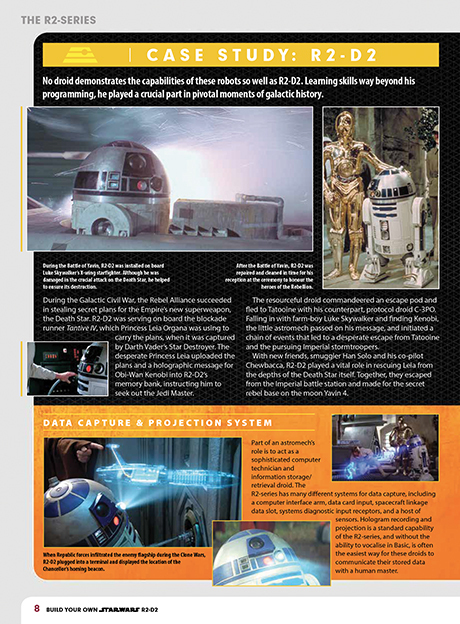 Projector: Just as in the Star Wars movies, R2-D2 is able to display holographic messages using a projector which can beam images of Princess Leia and Luke Skywalker onto any nearby flat surface. Realistic Droid Movement: R2-D2 travels around through powerful drive motors in his feet, which allow him to move forward or backwards or spin on his axis, just like the droid does in the movies. 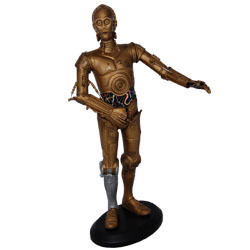 His third leg provides stability, and he has sensors which are programmed to avoid obstacles and stairs. Remote-control app-enabled: You can control R2-D2 directly from your Android or iOS smartphone or tablet. 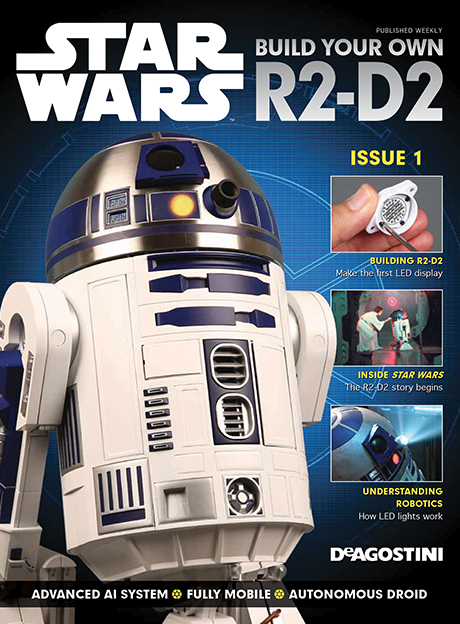 Steer him at will, see what he sees, and activate all his special features – including the pop-up lightsaber! 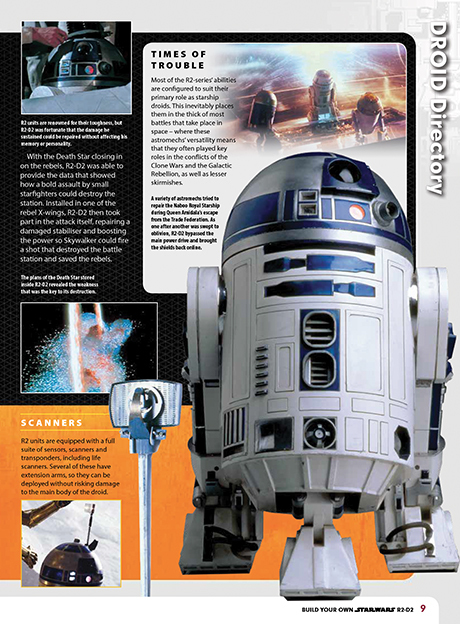 Pop-up lightsaber: As in Return of the Jedi, R2-D2 has a ‘hidden extra’ – Luke Skywalker’s lightsaber, which will pop up on demand from the pneumatic ejection tube in his head. 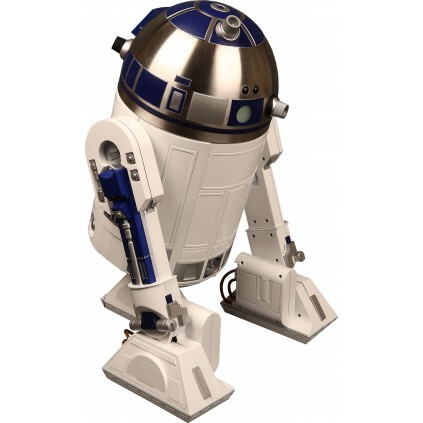 Rechargeable battery: Inside R2-D2’s chassis is a high-energy battery pack that stores power for his drive motors, robotic mechanisms and internal electronics. He comes with his own charging station which hooks up to his external coupling – and when his energy levels become low, his warning lights will indicate the need to recharge. Battery not included with series. Status displays: Including malfunction/diagnostic warnings. Microphone and speaker: R2-D2 is able to react to his human owner’s voice commands. 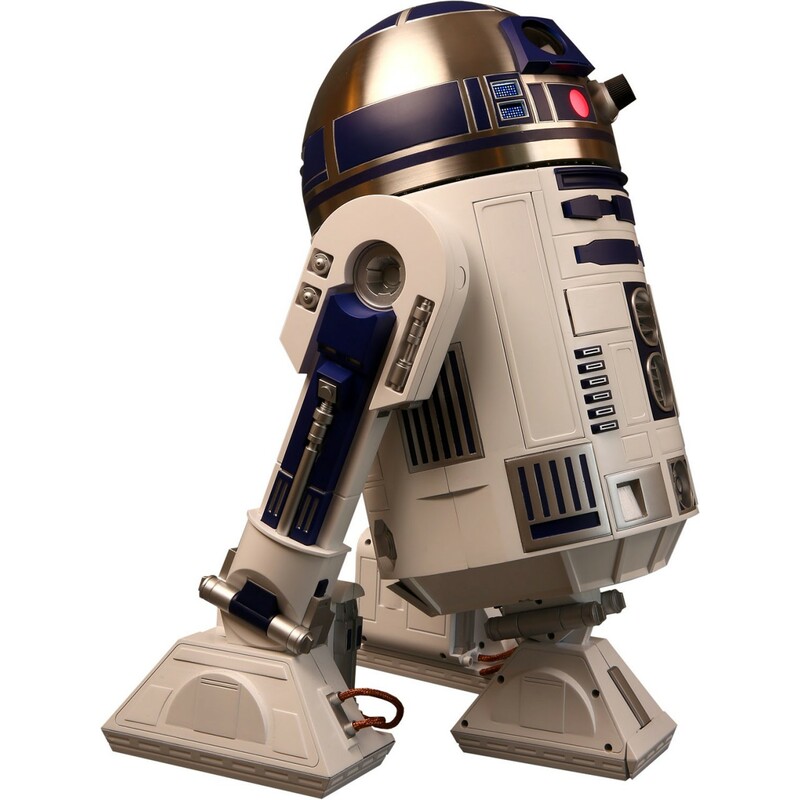 R2-D2 is programmed to respond to trigger words (such as ‘good morning’ or ‘wake up’) and he understands a number of simple voice commands that control his key functions. The droid will respond to his owner’s requests with a realistic range of reactions. Extending arms: As in the movies, R2-D2 can extend his spacecraft linkage and control arms on command, and they also operate when R2-D2 is in autonomous ‘AI’ mode. The flaps on his body conceal hidden droid manipulator arms and probes, which you can extend at will. 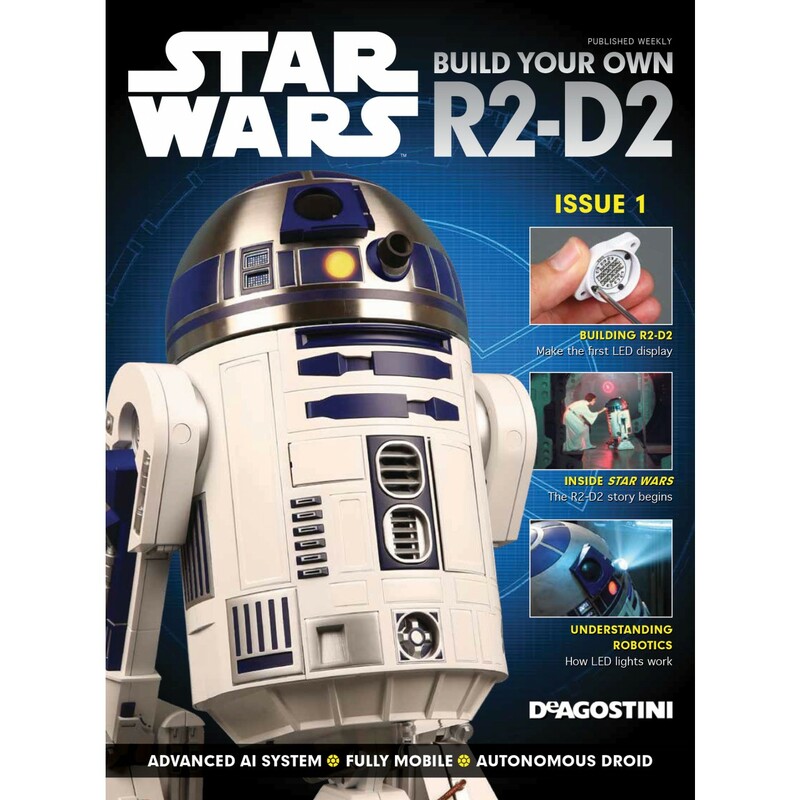 You will build your R2-D2 from components engineered to look just like the original Star Wars props – plus state-of-the-art modern electronic components. 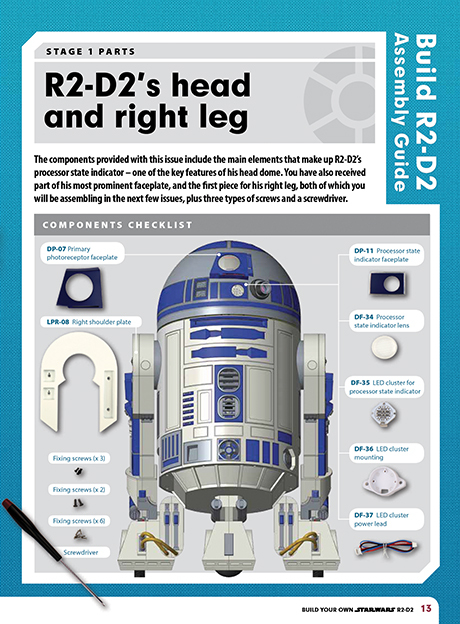 Taking inspiration from the remote-controlled film prop, your fully functioning half-scale model R2-D2 is engineered in the same way, and has been authentically detailed based on the droid seen on screen. 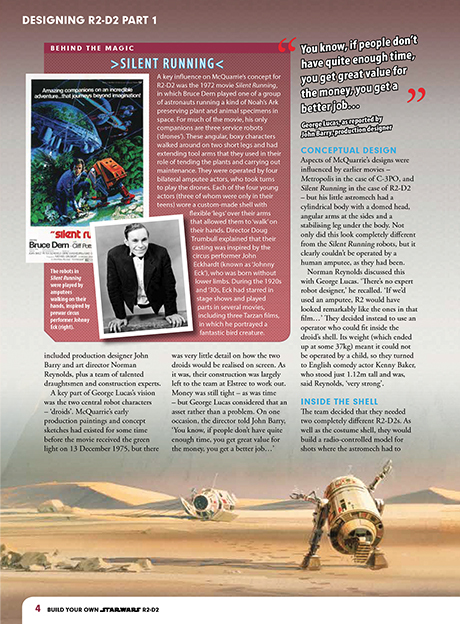 Once assembled, you can choose whether to retain the factory-fresh finish, or give your astromech a weathered, ‘used’ appearance as in the movies. - Apple iPhone 5S or later running iOS 11 or higher. - Android smartphones running OS 4.4 KitKat or higher. - Apple iPad running iOS 11 or higher. 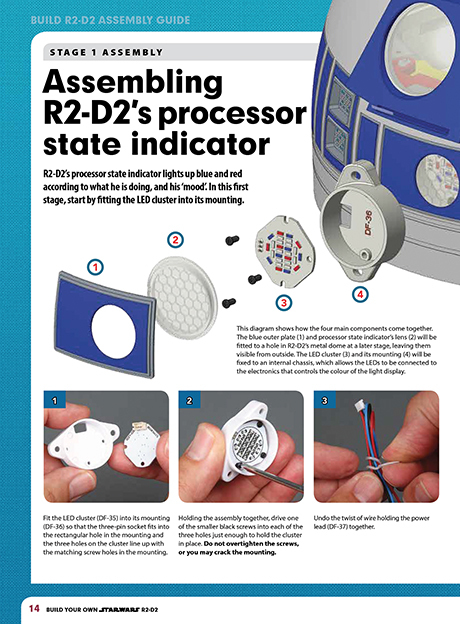 Once it is installed on your device, please refer to the online User guide in our downloads section for detailed instructions on using it to control R2-D2. 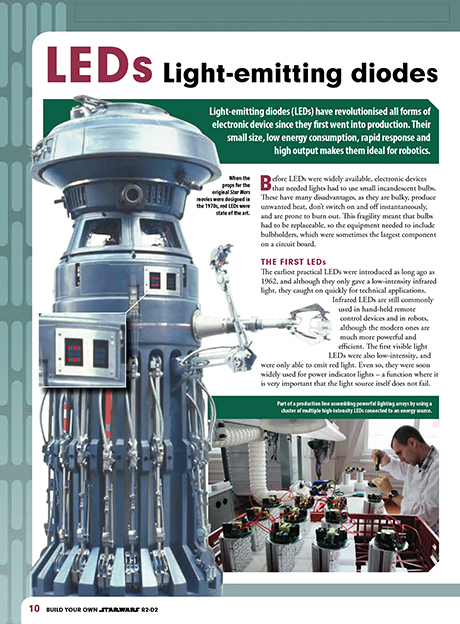 These batteries are optimised for use in R2-D2, but other suitable batteries are available from independent suppliers. Important Do not charge the batteries, attempt to fit them into the batter box, or install them in R2-D2 until instructed, when all the internal wiring is connected up. 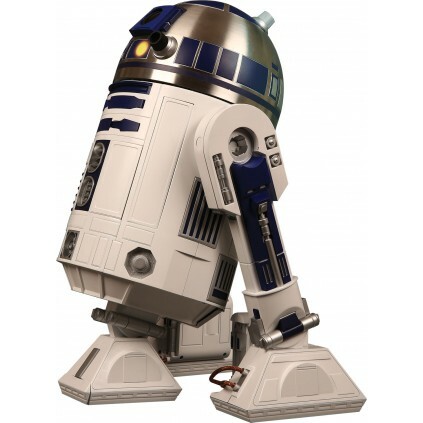 COMING SOON - a link to order batteries optimised for use in your R2-D2 droid. More information will be available shortly. This is first product from this company and I think the model itself, instructions and magazines are excellent! My one design issue is the point made earlier that the robot is locked in drive mode which means the front wheel does not retract and the side leg ankles are not articulated. I didn't think I would miss that and I can see how it would be more expensive to make that mechanism while providing stability for 2 legs. That being said, I bought a smaller R2D2 that has the retracting leg, articulated ankles and stability for $149. Its only 6 inches tall but the way it moves is amazing. Maybe a version 2 of this larger version may be in the future? From an assembly point of view I have a view wishes. 1. Clearly label the screws and clearly call them out in the magazine instructions. Screws come in one shipment but used in later shipments. They sent me a screw organizer box. Sounded nice but I don't want to separate screws from shipment numbers since that is sometimes how they reference them. 2. What is a "fixing screw"? They usually provide dimensions like a 2.3 x 6mm screw then in another assembly just say "fixing screw". It becomes trial and error. 3. Perhaps send all the screws at the beginning? I know you probably have all the screws, packaging, shipments, instructions built for all future orders but for next time or future models... 4. Would like to see some kind of master build document showing all subassemblies and timing. Of course without that, every shipment is a surprise!. FYI, you start with the right rear leg, then start on the dome, finish the right leg, start the left leg and continue with the dome. I just finished magazine 44, shipment 11. While the one design limitation and some build concerns exist, I don't regret my purchase and the building has been a great experience. 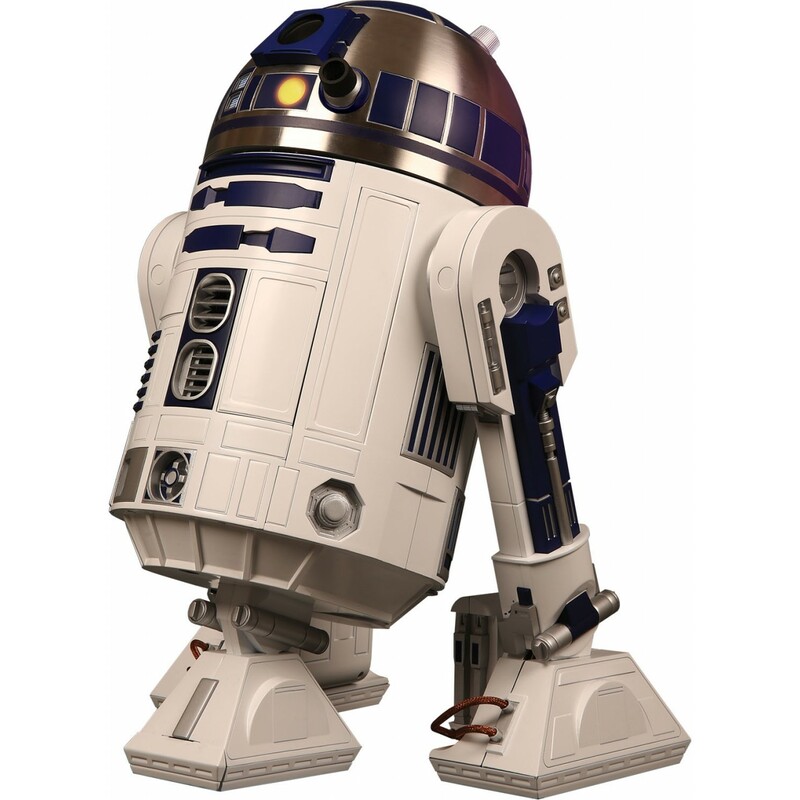 I look forward to R2 coming alive and then will probably move on to the Falcon or try my hand at a sailing vessel. This isn’t my first DeAgostini build. But, next to the Studio Scale Millennium Falcon, this is a blast to build! I’m particularly happy with the wiring harnesses. I’m a bit of an electronics idiot, so plug and play is sweet! The provided test board lets you try out each new display, and gets you amped up for more! My grandson is always wanting to see what I’ve done lately too. It’s a solid, quality kit. I'm 1/4 of the way through this build. Quality is simply top-notch. Sturdy, heavy construction, beautifully accurate electronics and metal parts where they should be. My only complaint is that the build per month is on the simple side (so far). Started this at the beginning of 2017, its now June and im 25 issues in, a quarter of the way. This is an absolute pleasure. I look forward to my delivery of 4 issues roughly the 3rd Friday of the month. I recommend every Star Wars fan should do this. 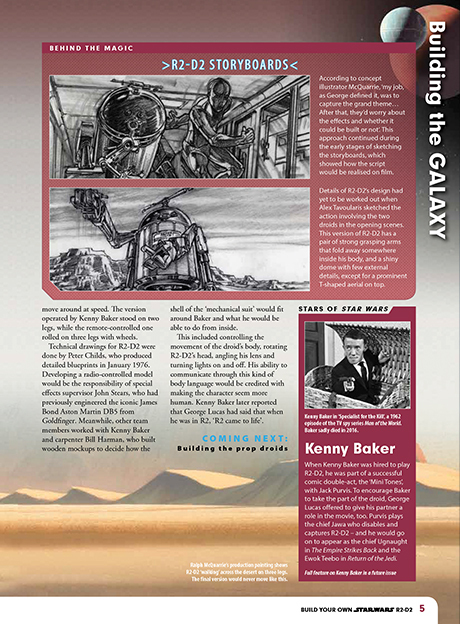 The magazines are well written with lots of behind the screens pictures and information, covering the whole Star Wars franchise, movies and animated series. 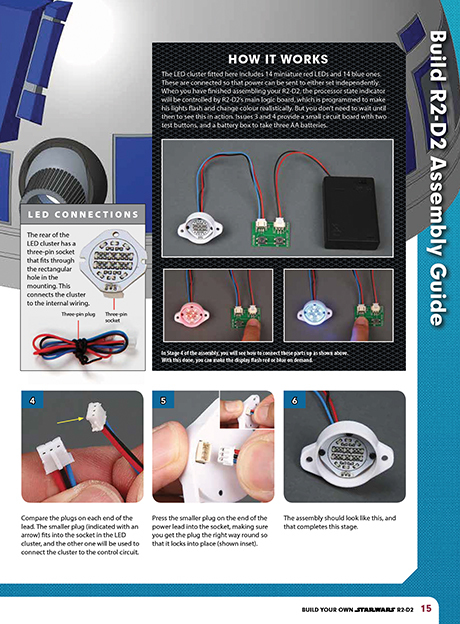 The build instructions are comprehensive, very step by step. shame the center leg dose'nt retract inside the body. Being a member of the r2 builders club I ordered this as a way to pass the time waiting on parts for my full size r2. I must say this is a very detailed droid. From the shipments I have received so far it appears to be a great model. A few small details differ from the movies but very minor. I highly recommend you get this for a fun and enjoyable project.